Raj Loomba with the Mayor of Kigali, Dr Aisa Kirabo Kacyira and Cherie Blair, discussing the progress of a widows empowerment project in Kigali, Rwanda. The lot of a widow is shocking in many parts of the world, the sorrow of losing her husband compounded by cruelty and injustice. Tradition variously dictates that she is unable to work or remarry; subjected to degrading ‘cleansing’ rituals; ejected from her home; her wealth taken by the deceased husband’s relatives; banned from wearing jewellery or coloured clothing; and left without any means of supporting herself or her children. Much is made, rightly, of gender inequality – the lack of opportunity and education faced by millions of girls and the routine abuse and discrimination faced by women. But ironically, the more we have become aware of women’s issues generally, the less visible have been the needs of widows. Truly they are the bottom of the pile – invisible, unheard, the poorest of the poor. The major initiatives aimed at relieving poverty – the Millennium Development Goals, the IMF Poverty Reduction Programme, Make Poverty History, the G20 - all are silent on the subject of widows. Yet the problem, identified in a comprehensive research study last year (Vijay Dutt, Invisible Forgotten Sufferers - the Plight of Widows around the World, with research by Risto F Harma, Loomba Foundation / Konark Publishers, Delhi, 2010), is huge: 245 million widows around the world, of whom 100 million live below the poverty line. Together with their dependent children we are looking at a crisis directly affecting some three quarters of a billion people. One and a half million children of poor widows will die before they reach the age of five. Cut off from earning a living, many widows have to rely on the efforts of their children, who miss out on education and end up on the streets or in factories, victims of exploitation and abuse. After sweeping this desperate issue under the carpet for many years, on 22 December 2010 the United Nations General Assembly, on a resolution by the government of Gabon and by unanimous acclaim, adopted 23 June as an annual global day of action to raise awareness of the issue: International Widows Day was officially recognised. This moment signified the unique achievement of one man: Raj Loomba, clothing tycoon, member of the Rotary Club of London and peer of the realm, who in 1997 set up a charity in honour of his mother to right the terrible wrongs that widows face and to give a voice to those who so long have suffered in silence. “I was only 10½ years old when my father died, in Punjab, India,” Lord Loomba recalls when we meet at London’s South Bank University, a few minutes from the House of Lords. “His body wasn’t even cremated yet, but my grandmother ordered her to remove her bangles, jewellery and bindhi – which is the sign of a married woman – and asked her not to wear coloured clothes ever again. “I was too young to apprehend the situation, but gradually I saw that her life had totally changed. Before, she was a happy wife. Now, she was a very distressed widow. Shrimati Pushpa Wati Loomba was just 37 in 1954 when – on 23 June, the day now named by the United Nations as International Widows Day – she lost her husband to tuberculosis and was left with seven children to care for. She was, as her son later came to realise, luckier than many: her husband had been a wealthy businessman and left her the means to look after the family. How she chose to invest that wealth is what ultimately provided the inspiration for the work that has now brought the plight of widows to the attention of the world. Never having had a day’s formal schooling herself, Mrs Loomba’s vision was to make sure that all her children received a good education. “We were all educated,” Raj Loomba explains. “My two sisters graduated from Punjab University in India in the 1950s, when most girls weren’t even going to school. I was educated in the US and it is this that has kept me going on this path. I always thought, if my mother had not educated me, or if she had not had the financial resources to do so, where would I be today? I would probably be in India plying a rickshaw –God knows what I would be doing. When Raj Loomba started his working life, however, all this was still far from his mind. The wealth so wisely invested was now gone and in 1962, when the family moved to England, he had to start from scratch, working at a factory in Staines where he mopped floors in the evening and took the rubbish out in a wheelbarrow. The turning point came from the savings made from selling ice cream from a van for four months in the North of England. “With that money my uncle, who was a wholesaler in Wigan, set up a small business for me - a stall in Widnes market. That is where I started selling ladies’ stockings and pantyhose, those sorts of things. I moved slowly into knitwear, from a market stall I moved into a retail shop, from retail shop to wholesale, from wholesale to import, from import to manufacturing - and today we have 300 retail concession shops in the UK. We have offices in London, China and Delhi. We supply House of Fraser, Debenham and other major stores.” Today, though still executive chairman of Rinku Group plc, Lord Loomba is wholly focused on his public and charitable work, while the business is run by his son, Rinku Loomba. And he knew that most widows in India could not do what his mother had done. So it was that Raj and his wife Veena established the Shrimati Pushpa Wati Loomba Memorial Foundation in 1997 with the aim of helping thousands of impoverished Indian widows do what Raj’s mother had done: educate their children and so break the cycle of deprivation that is often set in train by widowhood. The founding day target was modest when compared to the scale of the problem, but undoubtedly ambitious for a fledgling charity: to fund the education of 100 children of poor widows in each of the 29 States of India. Within a decade that target had been surpassed. By 2006 the Loomba Foundation was educating more than 3,500 children in India – in the process transforming the lives and prospects of thousands of families who by cruel circumstance had been plunged into despair. That achievement was due in no small measure to the support Raj Loomba was famously able to garner from corporate partners, political leaders, public figures and private individuals. The launch of the charity was attended in both Britain and India by the respective prime ministers of the two countries. Sir Richard Branson became patron-in-chief, personally committing to fund the education of 250 children for five years and raising the charity’s profile with collections on his Virgin Atlantic flights all over the world. Joanna Lumley became an eloquent supporter and the BBC’s revered India correspondent Sir Mark Tully made a documentary for the charity. The Loomba Foundation’s annual Diwali dinners became a fixture in the London social calendar, attended by luminaries from Princess Anne to Boris Johnson, with charity auctions conducted by broadcaster Alastair Stewart. Most supporters have stayed the distance and in ten years the Diwali dinners have raised more than three million pounds to support the Loomba Foundation’s aid programmes. In Africa, too, the problem is more deep-rooted than current devastations like genocide and HIV. Attitudes are founded in traditions and so-called ‘customary laws’. 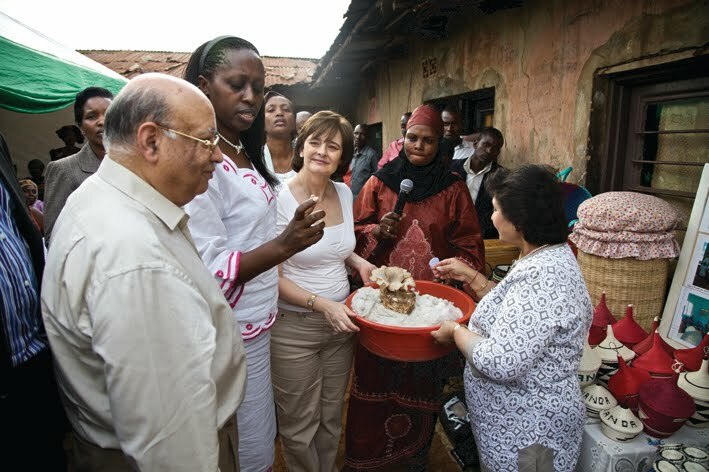 In 2005 Cherie Blair launched International Widows Day at the House of Lords in London and over the next five years, she and Raj Loomba did go knocking on all those doors, calling for international recognition of this day as a focus for sustained, effective, global action to bring about a radical and lasting transformation in the plight of widows. In 2006 the Loomba Foundation held an international conference on the topic at the Foreign Office in London, addressed by widows from ten countries as well as Cherie Blair, Hillary Clinton, Indian cabinet minister Renuka Chowdhury, Yoko Ono and the then Commonwealth Secretary-General Don McKinnon. The Foundation established offices in America and Canada and organised meetings at the United Nations, gaining the attention and support of leaders like Rwandan president Dr Paul Kagame and the former UN secretary-general Kofi Annan. The Loomba Foundation’s global programme grew through partnerships with Oxfam, Richard Branson’s Virgin Unite and the Prince of Wales’ overseas charity Youth Business International. Directly and with its partners, the Foundation today delivers aid programmes in 13 countries. The big problem with this cause was its invisibility. “I saw widows suffering in many, many countries. I travelled across Africa and South Asia, and wherever I went, widows were suffering in silence. They were not able to make their complaint to anybody, because nobody was listening to them.” Governments, NGOs, international organisations – all neglected the issue because so very little was known about it. What was needed was solid research - facts and figures to back up the many anecdotal case studies; analysis that showed the impact of this terrible blot on humanity. The Loomba Foundation initiated and supported an investigative programme with writers, researchers and institutions including Chatham House and in 2010, Vijay Dutt’s Invisible Forgotten Sufferers was published, with research by Risto Harma: the first comprehensive study of the plight of widows around the world. Backed with that hard information, support for UN recognition grew and the issue finally came to a head when President Ali Bongo Ondimba of Gabon and his wife Sylvia Najma Valentin threw their weight behind the campaign, with Gabon sponsoring the successful resolution in December. The Loomba Foundation will continue delivering aid directly and with its partners, but now the charity will increase its focus on advocacy and on supporting others to start their own programmes too. This year on 23 June, it will be 56 years since Shrimati Pushpa Wati Loomba became a widow – and, inspired by her vision, this will also be the first UN-recognised global day of action aimed at eradicating the injustices faced by widows from the world.